sundar72 - Sundar Narayanan's Travelog - Maggi - Unbeatable. My first experience with Maggi was in eighth grade !! For the perverted minds reading this, I am talking about the first time I ate Maggi noodles. My chitti had boldly gone where no woman in our house had gone before. She actually cooked noodles in an orthodox brahmin household, just because she was curious. The instant noodles had just hit the market and they had a very aggressive ad campaign. Although all the kids in our house (we all grew up pretty much in our grandpas place) wanted a taste of the noodles no one would make it. My grandma had decided that the noodles was either non vegetarian or was not something south indian brahmin folk should consume, and declared a ban on it !! Thanks to chittis little freedom fighting, we all got a taste and boy, did we love it !! Of course noodles was part of the staple diet when we were in college in BHU. Every saturday, there would be a big feast (I mean real feast with exotic items and a six course meal), and then the Maharaj (the head cook's nick name) and his chotus (the little boys who serve as his assistants) would leave for their village. That meant no food in the dorms saturday night and sunday afternoon. The catering halls would resume only sunday night with a small meal. In our freshman and sophmore year we used to go out of campus and eat dinner saturday night. By third year we got lazy, especially in winter time, and most weekends, I used to make Maggi in my dorm room for myself and a bunch of close friends on our room heaters !! Yes, we had little ceramic heaters with the heating coils exposed. We used to use them for heating our rooms and making maggi noodles, not to mention roasting some papads to go with the noodles. If we werent that lazy, we would walk to the nearby food stall (we used to call it Mochun's cafe) and he used to make noodles and cheese sandwiches for us. By the time I had come to the US, I had tried my hand at making noodles with many different flavors. My brother, a BITS'ian came back once for summer vacation and insisted on making "paneer noodles". He even bought me some panner noodles outside BITS when I went to visit him the following year ! My lonely erratic graduate student lifestyle saw me go through many a packet of noodles, but not maggi. I had to settle for the Ramen noodles. Used to throw out the beef or chicken flavor packets and put Indian curry powder and asafoedita instead. This week, my wife got me some Vegetable Atta Noodles by Maggi. This new creation is supposed to be wheat noodles. At first I was skeptical about it. The masala tastemaker packet was bigger than usual. Then I found out that the masala already contains peas, carrots and onions, with all the usual flavors. Was absolutely delicious !! 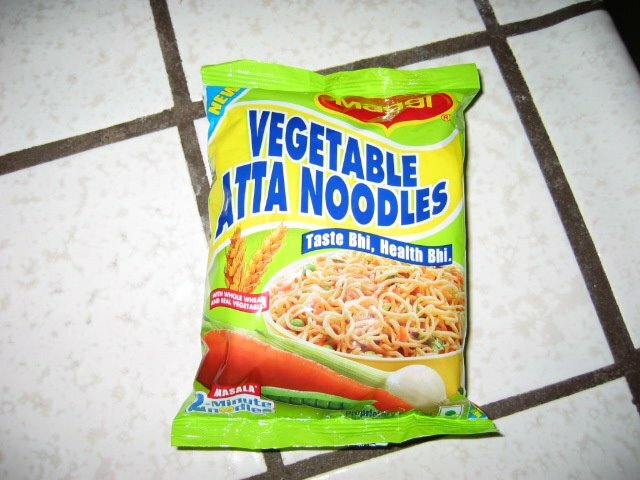 We are officially switching to the Vegetable Atta now !! yeah....maggi is something tht has become a household thing in every indian house now...ease of cooking and the taste tht apeals to all ages is the secret of its success i think not to mention the ad campaigns....as a matter of fact my lunch today was maggi! Maggi joru...suvaithu paaru :) Haven't heard about this Atta noodle. Ingayum kedaikkardhaanu paakaren. I dont get Vegetable atta here... The normal ones i do. And i miss the vegetable maggi soooo much. Loved it when it first came out. Maggi 2 minutes is a favourite thing for my kids.... and easy for us to give them quick. hey thats an interesting story on Maggi... i was going through the Maggi fansite, www.meandmeri.in, and saw amazing Maggi stories. i think you should post this there... its one great story!